My Mom found this recipe years ago in a magazine and tried it for the first time on Dad as a late dinner for him one night – it was a hit and all of us still make it regularly. 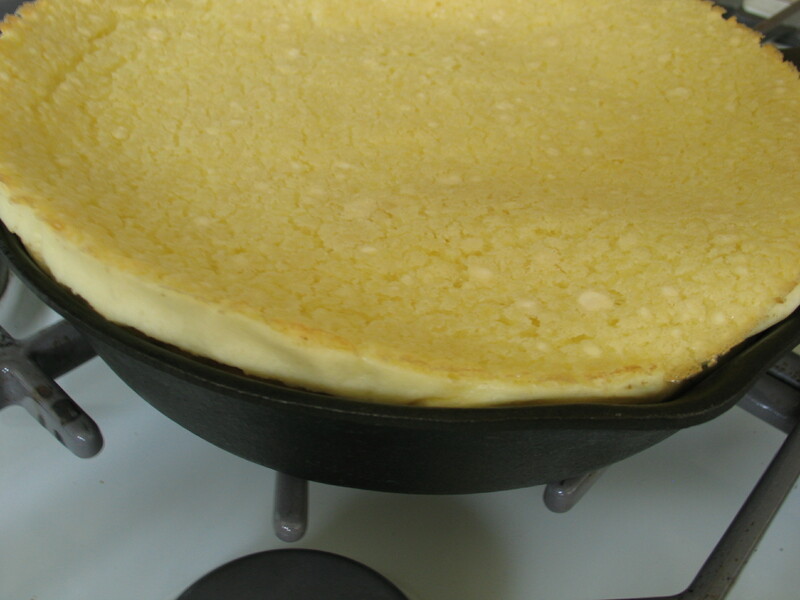 I’ve since seen it several times over called a German Pancake, a Baked Pancake, a Cast Iron Pancake – you get the picture. All you need to know is that it’s quick, easy and exceptional with homemade jam. Beat the eggs and salt together by hand for a quick minute and then add in the flour and milk, whisk well, and then lastly stir in the butter. 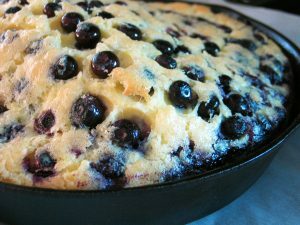 Pour into a 10-inch (bigger or slightly smaller works just fine), well greased cast-iron pan or oven-proof skillet. Bake at 350 for about 40 minutes until the edges are slightly brown. This will puff up. It may come out uniformly 4 inches high, or with big bubble waves, it all depends on the whisking, but it will inevitably taste the same. Please also note that it will drop a couple of minutes after being out of the oven. Did I mention that it really should be eaten with homemade jam? The recipe also works great using any ratio of the recipe. I often half it and spoil the girls with a pancake snack on a chilly day. An update! 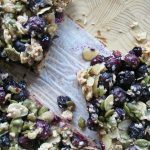 – we tried throwing in a cup of blueberries and it worked out brilliantly!